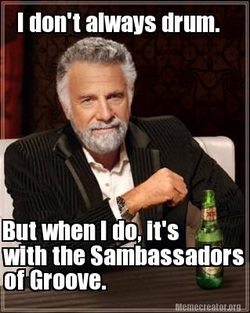 The Sambassadors of Groove are a true community band - our members are all ages, from all walks of life and all shapes and sizes! The one thing we all have in common is a love of the groove! Whilst the band enjoys a long-established reputation as a top-quality performance band, thanks to our hard work and high standards, we all have to start somewhere! As imposing as a samba band in full swing may seem, it's actually a very accessible art-form at beginner level, and you really don't have to be a musical genius to play. However, there are always plenty of challenges for fast learners or those with previous drumming experience. Everyone is welcome, so if you fancy becoming a Sambassador, come along and see what it's all about! We rehearse at The Band Factory, Althorpe Street, Leamington Spa, just five minutes' walk from the bottom of The Parade. Our full drum rehearsals are on Thursdays from 8pm to 10.30pm where we run through the performance set and learn new compositions together. On Sundays (contact us to confirm when) we occasionally have an optional Technical Workshop session with smaller percussion groups, especially suitable for new members learning the ropes, as well as for more experienced players to pick up new tricks, styles or try a new instrument. You can come to either, or both, but anyone wanting to play shows with our performance band will need to be able to make the Thursday sessions fairly regularly. You can try it out for free; the first three sessions are without charge and newcomers will always find a warm welcome here at the Band Factory. If you're ready to give it a try, simply turn up to one of our sessions and say hello, and we'll get you kitted up and grooving in no time!